Dealing with multi-vendor physical, virtual, and hybrid computing environments can be a daunting dilemma for IT Administrators. Faced with such challenges, administrators frequently turn to incremental systems management solutions to overcome data center inefficiencies. But all too often the very tools meant to alleviate these ever-increasing complexities only add to the confusion, and restrict flexibility in addressing the issues of evolving IT environments. At Dell, we take a different approach. We’re reducing the number of tools needed to manage complex IT environments. And the first step in that approach is to simplify and automate the most essential and repetitious IT operations associated with keeping the heart of your data center, and your business, up and running smoothly – server lifecycle management tasks. OpenManage is further set apart from other systems management solutions because it is developed on the industry standard Unified Extensible Firmware Interface (UEFI) platform and Web Services for Management (WSMan) interfaces, which provide an open environment for console integration. 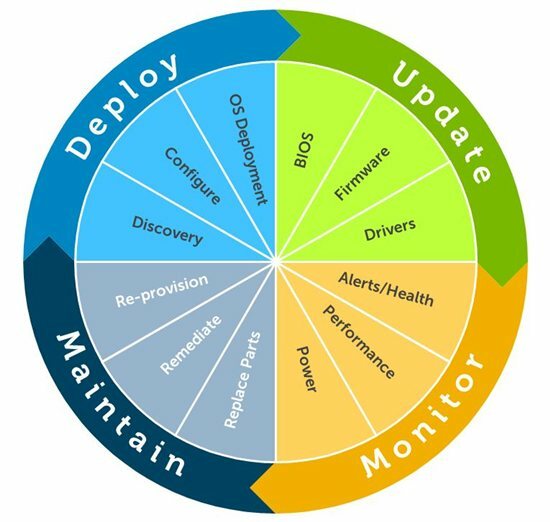 Development on open standards allows Dell to integrate the capabilities of iDRAC with Lifecycle Controller with other leading systems management consoles like Microsoft System Center Configuration Manager, BMC Software BladeLogic Operations Manager and Symantec Deployment Solution. IT departments can take advantage of all of the benefits of embedded management features in Dell PowerEdge servers and make the most of their existing systems management solutions. This is just a glimpse of what is possible. To learn about how Dell OpenManage and PowerEdge servers can help alleviate your data center management challenges click here to view a video that highlights what we’re talking about. Let us know what you think.